LITTLE ROCK, Ark. (Football) – The Little Rock Touchdown Club and Wright, Lindsey & Jennings LLP announced the nominees for the third annual Cliff Harris Award, presented to the nation's top small college defensive player. 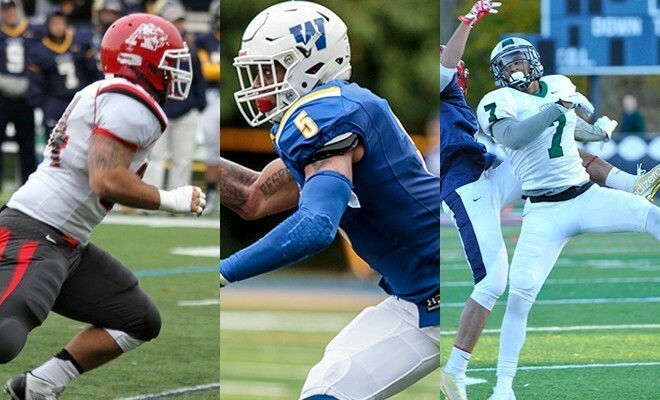 The Middle Atlantic Conference had three student-athletes named to the list. Albright's Steve Barroso, Widener's Brandon Jones and Stevenson's Austin Tennessee were selected as nominees for the prestigious award. Tennessee was also a nominee for the 2014 Cliff Harris Award. The award will recognize the best defensive player from among more than 500 NCAA Division II, III and NAIA teams. Cliff Harris was a safety for the Dallas Cowboys, who played for NAIA Quachita Baptist, and went on to play in five Super Bowls and six Pro Bowls. Barroso, a senior linebacker for the Lions, was named to the 2015 All-MAC First Team. The senior was named to the 2014 All-MAC Second Team. Barroso, as a linebacker, tied for a conference-best six interceptions this season, with one interception return for a touchdown. He also led the conference with five fumble recoveries. Barroso averaged 6.3 tackles per game and had two sacks on the season. Jones, a senior defensive lineman for the Pride, was named the 2015 MAC Defensive Player of the Year and to the All-MAC First Team. The senior led the conference with 23 tackles for loss totaling 128 yards, and 16.5 sacks for 102 yards. Jones also ranked second in the conference with four forced fumbles He averaged 6.2 tackles per game. Tennessee, a junior defensive back for the Mustangs, was named to the 2015 All-MAC First Team. The junior is a two-time All-MAC First Team selection. Tennessee is also a two-time Cliff Harris Award nominee. The junior led the conference, along with Barroso, with six interceptions. He also led the conference with 18 total pass breakups. Finalist for the award will be released in two weeks, and the Cliff Harris Award winner will be announced on Dec. 24 and honored at the Little Rock Touchdown Club annual awards banquet in February 2016.